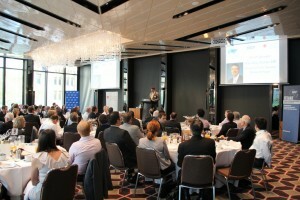 The annual ITEANZ/Engineers Australia Transport Branch breakfast meeting was a staggering success. We would like to thank the honorable Minister for Transport Mr Terry Mulder for his speech, and answering some challenging questions from those in attendance. We would also like to thank the RACV for their sponsorship, and for hosting the event at the RACV Club of Victoria. Without their support the event would not have been possible.